Welcome to Palestine Today, a service of the International Middle East Media Center, www.imemc.org, for Tuesday, December, 13, 2016. Israeli troops demolish Palestinian home and kidnap civilians during invasions targeting West Bank communities. These stories, and more, coming up, stay tuned. Israeli army bulldozers demolished on Tuesday morning two Palestinian structures and a store at the town of Sur-Baher near Jerusalem. The army claimed that all three structures are too close of the Israeli separation wall built on Palestinian land. Sur-Baher town is under total Palestinian Authority control. Two of the structures are owned by the Abu Tair family, one is a foundation for a house that the family stopped construction on last year after military orders. And the other is a storage shed used to store construction materials for the house. The soldiers confiscated all what was stored in the shed, the family told local media. Moreover bulldozers demolished a nearby hardware store in the town after consecrating all the martial inside it. In Tuesday at dawn, Israeli army forces invaded West Bank communities, searched homes and kidnapped 12 Palestinian civilians. Local Palestinian sources reported home-searches and kidnappings in the northern West Bank cities of Jenin, Nablus and Tulkarem, in addition to the southern West Bank cities of Hebron and Bethlehem. In other news, Israeli soldiers detained on Tuesday a Palestinian woman at the Qalandia checkpoint separating Jerusalem from Ramallah in the West Bank after they claimed she tried to ram soldiers with her car. Israeli media sources said that the soldiers fired at the Palestinian woman car and injured her as she was trying to ram them. No Israeli soldiers were injured in the incident. The Israeli army claimed that they detained the Palestinian woman without harming her. The circumstances of the incident remains unclear until the time of this report. 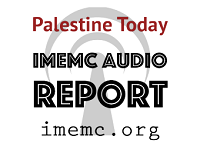 And that’s all for today from the IMEMC News; this was the Tuesday, December, 13, 2016, news round-up from the Occupied Palestinian Territories. From more news and updates, please visit our website at www.imemc.org Today’s report has been brought to you by George Rishmawi and me Ghassan Bannoura.